Adult Children at Home? Learn strategies for making it work — including how to word a contract for adult children living at home that makes the rules clear! If you’re dealing with adult children at home — or kids who never left home — you need to know you’re not alone. My name is Christina Newberry, and since 2008 I’ve been helping thousands of parents like you make the best of having adult children living at home. Having grown kids living with you can be tough, especially around the holidays. As an adult who has successfully lived with my parents after leaving home — twice — I’ve learned a few key strategies. I’ve taken these winning strategies — along with a few mistakes — and combined them with proven communication tools and in-depth research to develop a step-by-step guide to surviving (and thriving!) when your child returns that’s been featured in media worldwide. You can find out more about my guide below — including my adult children living at home contract — or fill in the form to the right now and I’ll send you a free report to help you avoid the 8 most dangerous mistakes parents make when their adult children live at home! How to tell the difference between constructive support and dangerous support that can hurt your children. Three key ways adult children who return home must be treated differently than before they left. An adult children living at home contract can help set agreements on…. Privacy rules for both parents and their adult children at home. Which chores your grown kids will be responsible for. This contract for adult children living at home comes in an easy-to-use, customizable format, written in easy-to-understand, plain English! How to charge them rent and help them get back on their feet — at the same time! The best way to help them overcome crippling debt — without taking on the burden yourself! This fully-customizable calculator helps you determine the impact of having an adult children at home on your household budget, and lets you assign a portion of the current costs — or the total additional costs — of having them live under your roof. I’ll even include a handy 4-page guide, showing you step-by-step how to account for different types of household expenses! The eBook, Contract, and Budget Calculator are all in a downloadable format you can start using in minutes — and come with my unconditional 30-day, money-back guarantee …all for only USD $27.97 now just $19.97! 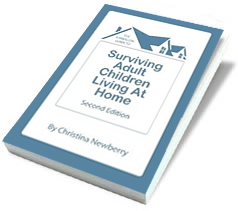 Click here for more detailed information about The Hands-on Guide To Surviving Adult Children Living at Home Downloadable eBook or click the button below to pay securely with PayPal or your favorite credit card. If you have adult kids at home over the Christmas holidays, take the time to follow these tips to ensure peace and goodwill among the whole family!